Free ebook – Cut the crap. 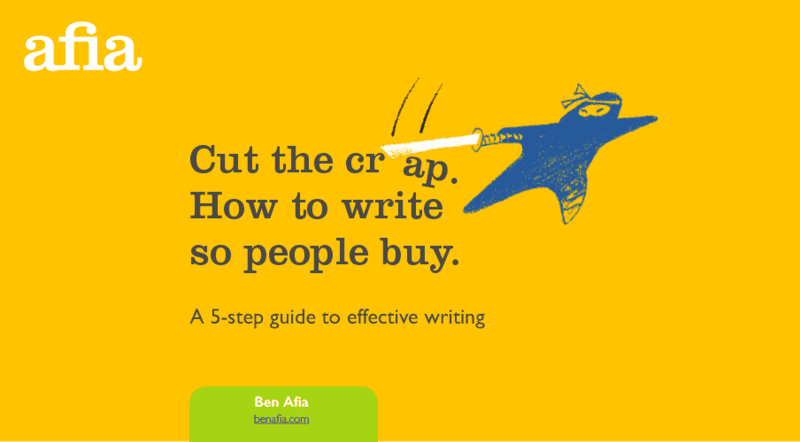 How to write so people buy. Do you worry about customers trusting you? Do you think your businesses writing is letting you down? Well, you’re not alone – most businesses I meet have similar thoughts. Much of my work is helping companies get clear on their brand and tone of voice. But these are only a means to an end. What really matters is giving people the skills to connect with customers so they can make them happy. And happy customers buy more and stay with you longer. So how do you give them those skills? Well, we’ve trained more than 5,000 people since we launched in 2004. And we’ve trained trainers to reach another 30,000 or so, in big brands from Vodafone to Ronseal. That’s let us test loads of different exercises. And it’s helped us see what gets people writing more effectively and on-brand. For years, we’ve refined our method, and I thought it was time to write about it. people more likely to get your message and do what you want. And you can download it for free.